Two members of the Charlotte 49ers men’s soccer team were selected preseason All-Atlantic 10 in a vote by the league’s 14 head coaches. 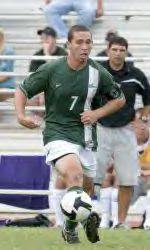 Senior midfielder Adam Gross, who was a 2008 ESPN The Magazine Academic All-American, was named to the preseason All-Atlantic 10 team. While freshman midfielder Steven Saballos was named to the preseason A-10 all-rookie team. Last season, Gross (six goals, six assists) played a major role in helping the 49ers earn their first national ranking since 1998. Charlotte captured three regular-season tournament titles en route to 12 wins. Saballos, a midfielder from Miami, played for the Miami Kendall F.C. in the United States Academy League. He is a United States Under-18 National Team Pool player. The 49ers kick off the 2009 season when they host Gardner-Webb in an exhibition at 7 p.m. Aug. 23 at Transamerica Field. Charlotte opens the regular season at 7 p.m. Sept. 1 at South Carolina.